Sassafras isn't about the fuss. We're all about the food. Say hello to London's newest supper club serving authentic New Orleans cuisine with a Great British twist. Our tailor made menu features a feast of unique Creole/Cajun flavours, carefully prepared by our New Orleans chef, Llewlyn. 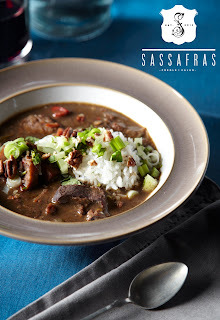 His legendary gumbo is culinary voodoo magic and each recipe delivers a real taste of NOLA’s rich food culture. This is the first of four SASSAFRAS supper clubs running in London. We’ll cover north, south, east and west, and our first hits London Fields this weekend. It’s a simple set-up with slightly different menus on Friday 7th June (game gumbo) and Saturday 8th June (seafood gumbo). We’ll start you off with an authentic cocktail, infuse your evening with the sounds of the Bayou, and finally fill you up with a delicious four course menu all served with typical Southern charm. It sounds good, right? It tastes even better. The sassafras flavour is essential to Louisiana cooking, particularly in the form of filé powder, or gumbo filé, the spicy herb made from dried, ground leaves of the sassafras tree. Initially adopted and used in cooking by Native Americans in the South, the herb was adopted into Creole cuisine in Louisiana. It's an essential and authentic part of Cajun cooking and it felt the perfect fit for our new food experience."